Zsofi, goddess of destruction, raving at the 'worshippers' consuming food at her Temple. Turtle and Neekto fill paperwork to approve Bassai's expedition, while Fenter and Tekki watch. Envoy, atop a statue in the Old Cemetary, notices an odd pattern on the ground and on a ruined wall. 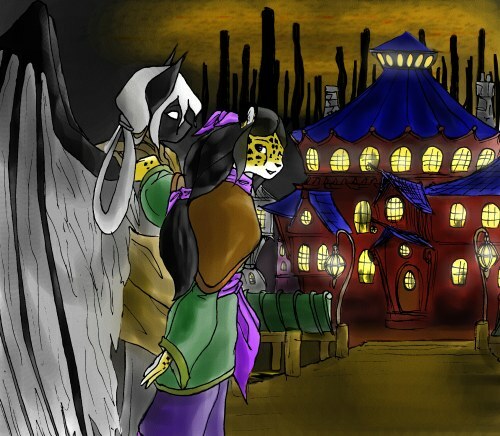 Ambassador Brishen Kara, representative of the High Prince of Babel, faces off against the ghostly Amaranth. Feli "Jynx" Kurai fights off another attack from the vicious vorpal bunnies during his journey to Blackshire Keep in Sylvania. Willow tries on a dress at Castle Diamante, and broods over the strange developments in her life as of late. Willow fights Weatherwax on the back of a steam train, high above Gutenburg in Chronotopia. Winterhind, Elder of the Aelfin, pleads her case before the Eeee council. Zoltan strikes at the Progenitor -- a giant alien brain-bug. Zoltan, wearing the armor of the Champion of Shadows, strikes a crippling blow to a Silent Ones "Lawbringer"-class Titan.